A friend of mine once told me his method of flower gardening was to see what comes up then just pull out the weeds. That actually is a viable way to approach it especially you have a personality type that doesn’t mind a bit of disorder. For a while my friend was moving into a new house every five years or so. In nearly every case he inherited a garden from the previous property owner and his laissez-faire gardening theory worked quite well. If this sounds appealing, you can help your own garden become more self-sufficient by planting appropriate plants. One obvious option is to plant perennials that come up every every year. They can be left in place for many years until they get old or big enough that they can be divided and moved occasionally . The problem with perennials is they often don’t provide enough interest through the entire garden season. Planting annual flowers will add welcome color to an otherwise drab perennial garden. Some annuals will successfully reseed themselves year after year. Because many annuals sold are hybrids, their first year will most likely be their most colorful year. Hybrid plants often don’t come back true to type the second year and beyond. Instead they tend to revert back to their ancestral traits. The color may not be as vibrant, the height or shape may be a little more “wild” but hey, we’re not looking to establish a formal garden. Cutting off faded flowers, also known as dead-heading, through the summer, is a common management technique to keep annuals producing new, fresh flowers through the season. However, ff you want your annuals to come up next year, keep in mind that the reason plants flower in the first place is to make seeds for reproduction. So near the end of the season stop dead-heading and leave some flowers to complete their life cycle in order to produce seeds. 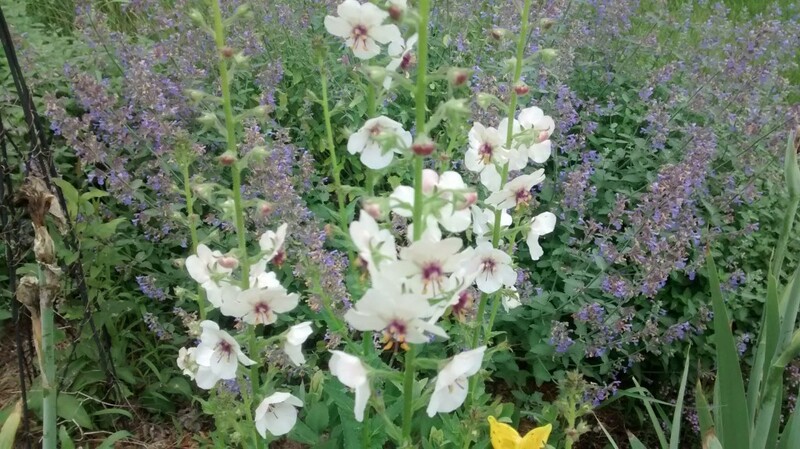 Wild flowers like verbasum make a wonderful addition to a low maintenance garden. Here’s a list of annuals that I’ve had come up on their own in my garden through the years: sunflowers, calendula, snapdragons, cosmos, celosia, lamb’s ear, monarda, nicotiana, California poppy, decorative herbs like fennel, portulaca, salvia, nasturtiums, hollyhocks which are biennials, verbascum, cleome, lychnis coronaria a perennial that produces lots of seed, alyssum, sweet pea, baby’s breath, chamomile, morning glory, even petunias. There are probably more but that’s all I can think of right now off the top of my head. After a mild winter you may see even more annuals come up during the following spring. One spring after a particularly mild winter, I had a bumper crop of castor plants that had come up on their own. If you are new to gardening, it may take you a season or two to learn how to tell the difference between a weed and a flower you want to keep. That’s all part of the fun.